“Work is the bane of all coffee drinkers.” Or so says the great Oscar Wilde. How came then, the vision of the diligent reporter or writer working away steadily at their work, with a cupful of coffee by their side? Strange as it may sound, coffee, when taken in excess, and without nourishing food, temporarily produces some of the more disagreeable consequences incident to the use of ardent spirits, though it is considered to powerfully counteract the effects of opium and intoxicating liquors. This interesting dual quality of coffee (and tea) make them good stimulants, and thus bring about the widely believed fact that all authors and intellectuals MUST partake of a steaming cup before starting their work, and many more during the course of their employment. This however, is found true of only coffee made from pure, freshly ground coffee beans, the most famous of which are the Coffea Arabica (“arabica” coffee) and the Coffea Canephora (“robusta” coffee). Bangladesh has always had more tea based consumers, because of the availability of only “instant” coffee in most cafés . This instant coffee, is definitely a poor substitute of the heartening freshly ground coffee, which is now available in many places like Café Mango, Coffee World, and a few months back at Kozmo Lounge. The introduction of properly ground coffee came late, a few months back, at a coffee festival held at Kozmo Lounge, and the opening (at nearly the same time) of Coffee World at Etc. The coffee market has now expanded in these few short months, and coffee has become almost as indispensable as tea in our diets. Nothing can definitely beat the soothing quality of a steaming cup of expresso or cappuccino, especially in the rainy season, which seems to be a dominant trend in Bangladesh. Of course nothing beats the heat, but Coffee World has prepared itself for even that, by introducing frappes and iced coffee delicacies. Though new to the customers, once tasted, one becomes an addict almost instantly, having to go back for more and more. 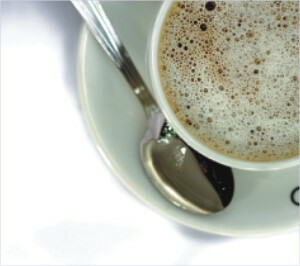 Addiction to coffee and tea, is, as most people claim, slightly because of the “caffeine” present in the coffee or tea. However, research has showed Arabica coffee to have only 1.2% caffeine content, while Robusta coffee has 2.0%. Though both are fairly low on caffeine, Bangladeshi consumers may continue drinking coffee in peace, because Coffee World and Café Mango, the leading coffee shops, as well as Movenpick and Kozmo, provide us with ground Arabica coffee, the one with the lowest caffeine content. Though Kozmo is more or less a restaurant and a hang out place offering scrumptious Thai and Chinese dishes as well as brownies, cakes and ice-cream shakes and floats, their coffee is one of the most popular items. Regular coffee, filtered from baked coffee beans, the coffee is strong and refreshing; more so than a cup of tea. Kozmo goers can just sit back, and enjoy the soothing atmosphere and listen to some music, or just chat with their friends with cups of coffee, after lunch, or a light snack. Though Café Mango was declared to be the favourite “hang out” spot for teenagers, Kozmo prefers to cater to everyone! With smiles and an enthusiastic eagerness to help you, the Kozmo staff enhances the attractions of the place, though nothing can compete with the coffee. Entering Coffee World, one wonders what draws customers to the store. Whether it really is something addictive about the coffee, or whether it is simply their amazing hospitality, and ability to make their customers feel important and welcome. Whatever it may be, Coffee World excels in both. “Our customers are, as always, our first priority, and we try our best to provide them with the best service, and high quality, fresh and innovative coffees, made by our master baristas. That is why we have introduced frappes in our menu, so that our customers have something cold to drink in the hot season, other than frizzy soft drinks,” says Coffee World supervisor Atiq. For coffee drinkers, Coffee World twenty six different types of coffee, like café mocha, Hazelnut Latte Frappe, Iced Latte etc, along with the usual cappuccino and expresso. All of these come in three different sizes, Presto (8 oz. ), Pro (12 oz.) and Alto (16 oz), and are quite fairly priced, ranging between Tk.65 Tk.150. So for those of the Dhaka population who have a decided soft corner for coffee, a visit to Coffee World is a must. Located at Banani at the premises of Book Express, and at Dhanmondi at the premises of Etc., Coffee World will soon be opening it's individual store in Dhanmondi sometime in the near future. Though not quite as dependant on coffee as its main feature, Café Mango also aids the coffee market by offering freshly brewed Arabica coffee in the forms of Café Chocomalt and Banana Frosty, alongside regular coffee and coffee latte. The price range here might be more within the limits of a student, being priced between Tk.50 Tk.90. However, Café Mango has a wider choice of brownies, cakes and biscuits; without which NO coffee break can ever be complete! While coffee lovers will be reveling in this sudden outburst of coffee in Bangladesh, this is also a chance for non-coffee takers to take a sip, sit back, and let the coffee do the magic. One really cannot form a distaste for coffee without tasting it first, and with Coffee World and Café Mango, among others, working determinedly to make addicts of everyone, being a coffee hater in Dhaka might just turn out to be harder than one thinks! The showers of the season make for some romantic reveries and bring out the poets in us. Indulge in a relaxed celebration of the elements by chilling out in our center. Although it is monsoon the sun is high in the sky. It is time to disembroil yourself from the topsy-turvy of workaholics. The best way would perhaps be to escape from the City, and get some travel done. Most people are taking a break from their schedule. Here are some of the few essentials that you need, assortments that are must-takes for your travel. Summer means the sun, which again is synonymous to sunburn. Pack along a sunscreen from a reliable brand. And of course, make sure the SPF is at least 30. This way, you can come back home without people thinking that you have just been living with a tribe in Tahiti. Travelling demands a lot of walking (and in some cases, even climbing!). Do not give your feet a nightmare by wearing uncomfortable, stiff or closed shoes. Let them breathe; grab a pair of open, airy shoes- preferably sandals. This can also protect your neighbours from the atrocious foot odour. Shades perform a dual-function: they protect your eyes from the sun, and that it helps you to do so in style. Help yourself to a frame that properly harmonizes with your face. Bear in mind that whatever looks good on Jamie Foxx or Jennifer Lopez may not exactly be flattering for you. Check to see whether you have taken along your phone. Also, store the travel agent's number and the hotel's number beforehand, in case of emergency. If the mobile phone seems like a mere drag-along and you do not want to take it along, keep these numbers written out on a piece of paper. Most people, while travelling, tend to carry banknotes with large denominations. While this can be a plus point when it comes to paying off the hotel charge and other substantial expenses, as the sage once said "small is beautiful". Small change is important for eating in roadside restaurants, petty shopping and transportation. Make sure that you carry a medicine kit with the basics- paracetamol, Band Aids, tablets for soar throat, etc. You never know when you might need them. Also, in most countries it is difficult to get a hand on medicine without prescription. In any case, when available, they are likely to be expensive.